“I let them get a little moldy, which creates a pattern that is as varied as one snowflake is from another,” Rowe said. She’s known as The Gourd Lady and, no, she doesn’t don a costume made of dried fruit — although she did wear a costume when she gave living history seminars at Missouri Town. Rowe has been a fixture at the fair for 19 years. 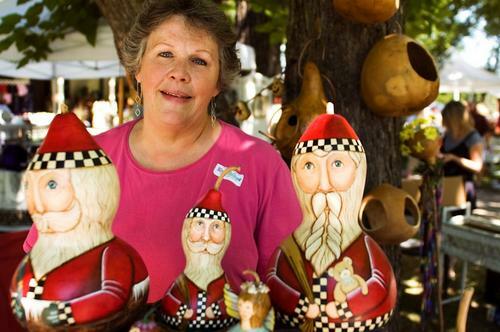 She and her dried gourd creations — which brightly caricature Uncle Sam, the Red Hat Society and the over-50 population — are as much a mainstay at the fair as kettle corn and carriage rides. The recently retired schoolteacher’s interest in gourds began as a hobby, but when she became a single mother, creating and selling art pieces made out of dried gourds emerged as a secondary means of income. The process of creating such an art form is extremely time-consuming, Rowe said. Allowing the freshly picked gourd to dry is the first step. This can occupy seven to eight months. Next, Rowe soaks and cleans the gourd in water and applies two coats of white sealer. She then pencils her design on the gourd, paints it and voila — gourd art. Depending on the amount of detail involved, the process can take as many as 50 hours to complete. In spite of the degree of craftsmanship Rowe invests in her artwork, she’s outspoken about her flaws. Her gourd art was displayed in the Museum of Folk Art in New York City for nine years. Also, her gourds made yearly cameos atop the White House Christmas tree during the Ronald Reagan presidency. For Rowe, the annual fair at the Bingham-Waggoner estate represents a terrific outlet for anyone looking to sell crafts or antiques.